August 05, 1999, L. G. Crabo. 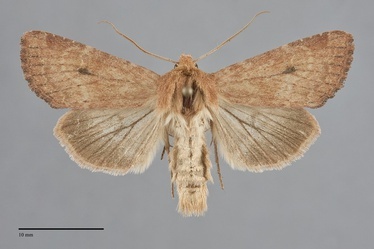 Apamea inficita is a medium-sized variably orange-tinted ochre moth (FW length 20–24 mm) with gray filling of the inferior reniform spot and faint other markings that flies in mountain forests during the summer. The forewing has an elongate slightly pointed apex. It is slightly mottled orange-tinted ochre, varying from mostly warm yellow to nearly uniform orange-brown in the Northwest. Some specimens are suffused with gray or appear tan. The distal costa except the apex is usually slightly to moderately darker than the rest of the wing, and the median area is darker occasionally. The antemedial and postmedial lines are usually faint, sometimes absent except on the costa, with a dark shade of the ground color adjacent abutting the median area and paler outside of the area, toothed on the veins with dark lines on the tips of the teeth at the postmedial line. The antemedial line is is angled slightly toward the outer margin. The postmedial line is smoothly excurved around the reniform spot, and then nearly forms a straight line at an angle toward the base. The median line is faint, bent in the cell. The subterminal line is pale ochre, sinuous, preceded by a thin shade of the ground color. The fringe is similar to the terminal area or slightly darker and grayer. The orbicular spot is round, very faint or absent, often evident as slightly pale filling. The reniform spot is kidney-shaped, similarly faint except for the lower third which is filled with dark gray. The claviform spot is absent. The hindwing is light yellow-tan, variably suffused with light to medium gray toward the margin, with gray thin discal spot and veins. The hindwing fringe is light ochre, sometimes with pink tint. The head and thorax match the forewing color. The male antenna is bead-like. This species can be identified by its light yellowish orange color and gray spot in the lower reniform spot. It is similar to Apamea lutosa and Apamea niveivenosa, but these species are usually more drab gray-ochre with more distinct markings on the forewing. Apamea niveivenosa lacks a gray dot in the reniform spot. 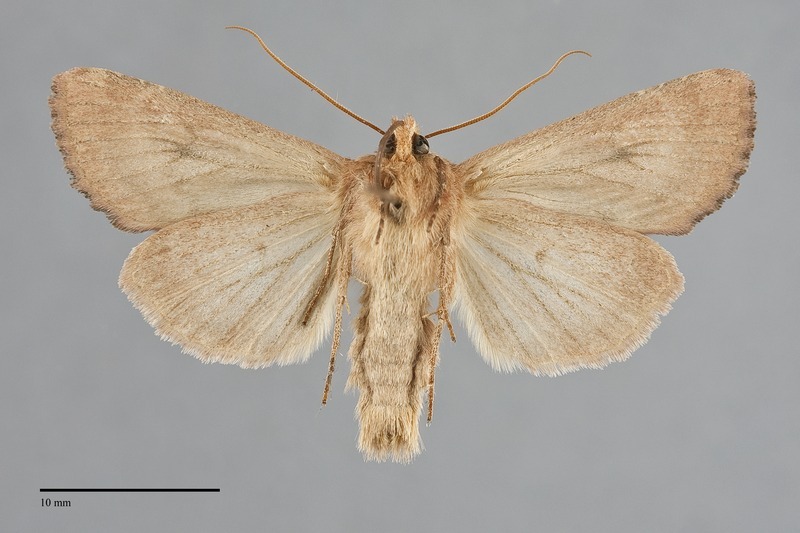 These moths prefer drier environments such as pine forests and steppe, while A. inficita is a moth of boreal and mountain forests. This species is widely distributed across Canada and southward through the Rocky Mountain region in moist grasslands and coniferous forests. In the Pacific Northwest, it is uncommon to common in mixed hardwood-conifer forests in the Cascades and Rocky Mountain region, and in quaking aspen forests at high elevations in the Basin and Range region such as the Steens Mountains in southeastern Oregon. Apamea inficita is found in forests throughout our region, mostly at higher elevations south of British Columbia. It occurs in the Cascades to southern Washington. In Oregon it is limited to Steens Mountain in Harney County. This species is found in the Rocky Mountains in Idaho and Montana. The range of A. inficita extends north into Yukon Territory. This species is widespread across boreal North America and in the Rocky Mountains as far south as Arizona and New Mexico. It occurs from Yukon and Northwest Territories to Newfoundland in the north, south to the northern Great Lakes region and New England. It does not occur south of Oregon near the West Coast. 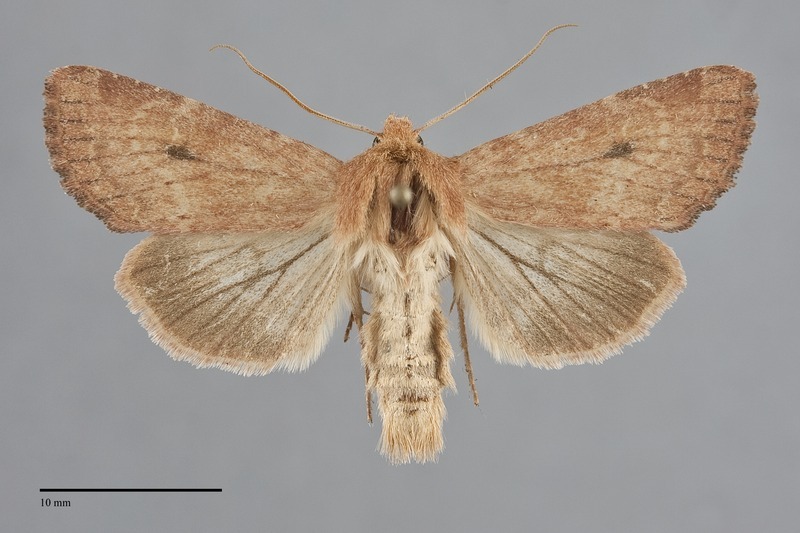 No information is presently available regarding the larval biology of this species, but it is probably a soil-surface feeding cutworm that feeds on grasses (Poaceae) like related species. Apamea inficita flies during the summer, typically in July and August. It is nocturnal and comes to lights.